Sunrise was a temporary installation at the Coventry Cathedral ruins as a metaphor to talk about the heritage of the site and Coventry’s future as City of Culture 2021. The project was a commissioned by NEON, working to identify and select a production company and communicate between them both understanding concept and technical requirements. The installation was a truss structure 14. meters wide and over 40 meters long with 40 colour wash RGBW lights individually controlled in time with the sound and 8 smoke machine filling the air to catch the light and create a sense of atmosphere. Aurora was a temporary installation at Printworks London for a leading tech companies staff party. The project was undertaken in collaboration with NEON, together we were commissioned to design and produce an installation for the Aurora bar, a chill-out area near the the main stage and catering. The entire installation was suspended over the bar from a mezzanine floor. We hung over 300 mylar space blankets which acted as large reflectors for 12 DMX controlled RGBW LED light bars. These bar coupled with 10 DMX controlled fans were installed so that movement could be created within the blankets, either by changing the angle of the light, or blowing the space blankets, to create different moods, when coupled with the changing colour of the light. Working with NEON, we were tasked to create a digital glitter effect for Miss Selfridge’s flagship Oxford Street stores Christmas window. We achieved the look utilising 132x 2.8M addressable RGBW LED strips networked to create a deconstructed video wall. Pixel mapping was achived utilising MadMapper and a Mac mini, the data was transmitted to Smart Show NetWS-2048 modules using ArtNet. Custom video content was created in Adobe After Effects using Trapcode Particular and the After Effects Syphon plugin for testing. The installation synchronises a bespoke Christmas ice themed sound track with over 130x 1.3M white LED strips mounted inside acrylic spikes. The effect is a dramatic pulsating light show drawing the eye to a crystal exploding from the shop floor of the flagship Topshop store in Oxford Street, London. The project, led by London based design studio NEON has involved weeks of research, design and planning the technical implementation, to ensure this high traffic, high visibility installation worked flawlessly during the 2015 Christmas shopping period. The lighting is controlled by DMX LED drivers, which are chained together to an ENTTEC Open DMX Ethernet controller that receives ArtNet data from Vezér, an OS X timeline and control program by Imimot, Hungry. After several prototypes and hours of work over the past few years, I finished the first fully working design of a split-flap display that I designed from the ground up. In May 2014 I was contacted by architect studio The Mobile Studio to produce 10 characters for an installation as part of the annual RIBA Windows event for London Design Festival in Regent Street. To read more about the Split-Flap Display project click here. In 2014 recent Central Saint Martins graduates Sonia Kneepkens and Maya Dufeu were invited to propose a redesigned limited edition clothing bank for The Salvation Army. Working with Sonia and Maya I helped them develop a prototype that helped them communicate their interactive clothing bank concept that uses LEDs on the outside of the bin to recognise how each donation contributes towards The Salvation Army’s cause. After The Salvation Army decided to have two of these banks manufactured, I helped onsite with the installation, debugging, testing and support of these bespoke interactive clothing banks for The Salvation Army. In the run up to Christmas 2014 I was asked to work with a BA (Hons) Design for Interactive and Moving Image student at London College of Communication to develop their raw concept into a finished working installation in just a few days. By tweeting a at friend with #LCCXmas the installation would select a random colour to illuminate the installation, take a photo and send a customised Christmas greeting to both the sender and the friend. 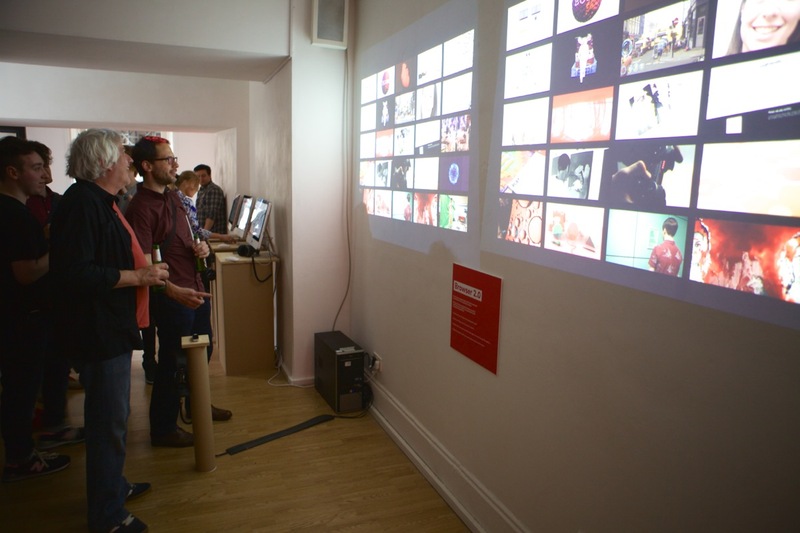 Every year graduate exhibitions try to deal with the issue of showing dozens of graduate films to visitors. There are various solutions including individual stations for each student, long looping showreels and scheduled showings. They all have their drawbacks. 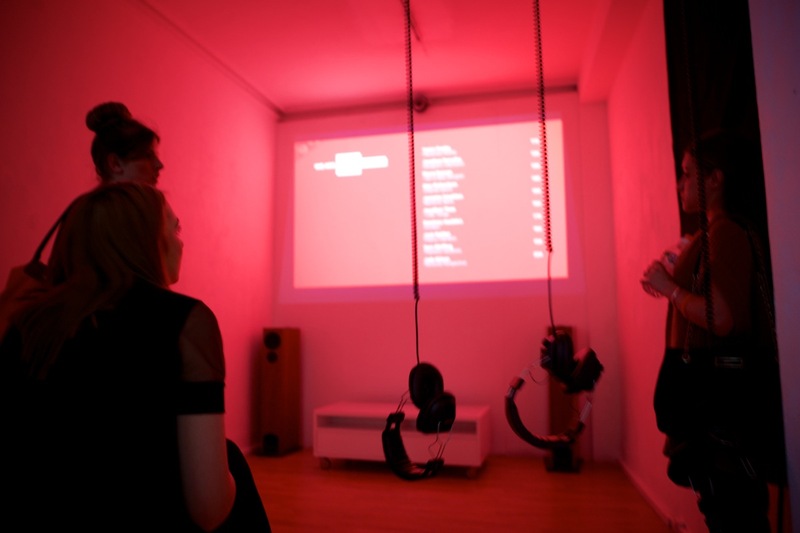 Video Vender is an alternative solution to some of the problems by presenting the graduate work in high definition in a cinema environment as they should be, with a jukebox like system for selecting the project to be played. Between films a series of options is displayed in a branded attract mode, then by simply entering the two digit code displayed on screen and the # key the desired film plays through before returning to the attract mode. This is the second generation of video selector. 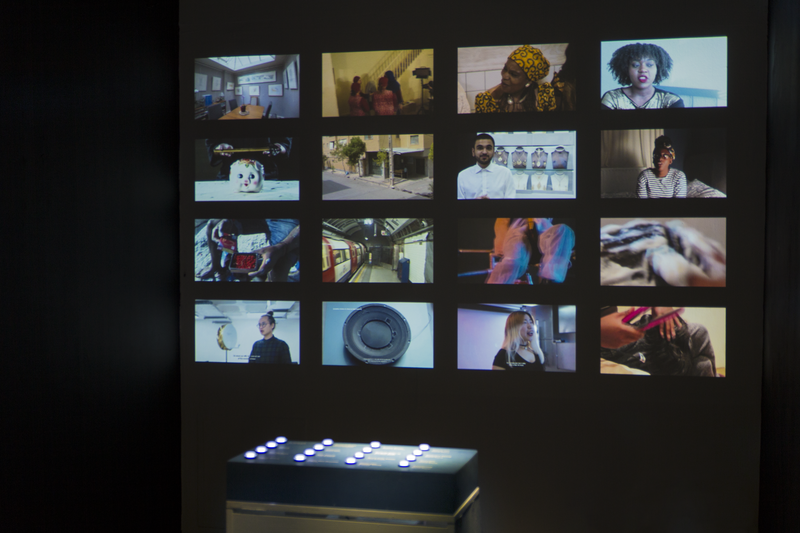 It makes it possible for the exhibition audience to directly select videos in an exhibition show reel, avoiding the need to wait for films to come back round. This time 16 white LED arcade buttons were wired up to an Arduino Mega, that interfaced with Node.js, Express and Socket.io to play back videos in a web browser. Pressing a button selects the corresponding video, the other buttons go dark and the video plays to the end. At the end the video returns to the attract mode where a short 30 second segment is played silently in a grid to reflect the pattern of the buttons. 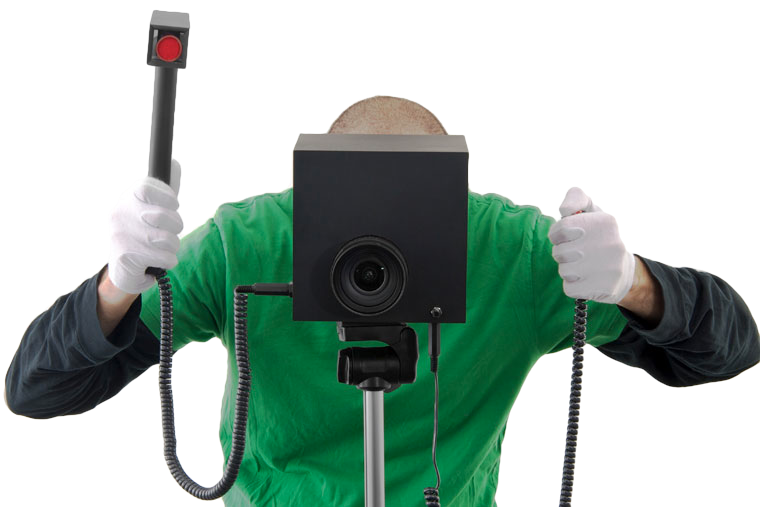 Camera X is an experimental camera that plays with human reactions. When the shutter is released the camera takes a series of image, whilst simultaneously firing a small explosive cartridge which launches material towards the subject. At the end of the sequence the camera captures the before, during, and after shots of the persons reaction to the unexpected detonation, and launched materials. 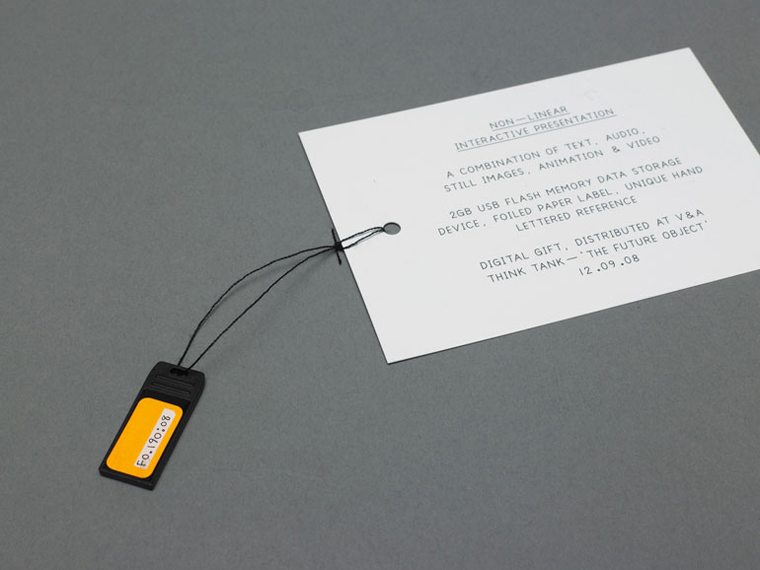 The V&A digital gift was a specially designed USB memory stick issued to attendees of a V&A event the investigated the future of object in a digital future. The project was a collaboration between Ben Stopher of Inventive&Co. and Suzy Wood and Martin McGrath of Wood McGrath. I provided technical expertise in the production of the USB memory stick, and the project of programming all the devices for both Mac and PC and the technical complexities that come from such an idea. For their 2013 degree show, BA (Hons) Graphic Design: New Media invited me to work with students to play a key role in the development, planning, design and construction of an interactive system that would display the work of students for their degree show. The result was a bespoke business card holder that presented student work in one of 40 trays protruding from a back illuminated panel. Each card represented a student and their work, featuring an abstract image on the front of their work, and the personal details on the read, including a QR code link to their website. The business cards could be inserted into one of the digital plinths where student work was presented onscreen in a linear view that can be scrolled through using the slider mounted in the plinth. In 2013 I was invited to design and build an interactive kiosk for browsing through University of the Creative Arts graduate work. Following on the success of this I was invited back to experiment with a 2nd generation of the system. Working in close consultation with the course team I developed a series of experimental interactions utilising a Leap Motion Controller and Google Chrome. Several of these experiments were combined to create a browsable system of graduates at the top level, and image and video work of the associated graduate below. Our modern lives are dependent upon proprietary technology which few of us could explain let alone understand how it works. A growing number of people are reacting to this proprietary technology by building their own devices, so called Open Source Hardware (OSHW). This project explores the application of OSHW to the design of everyday objects, taking the ubiquitous vacuum cleaner as it’s subject. 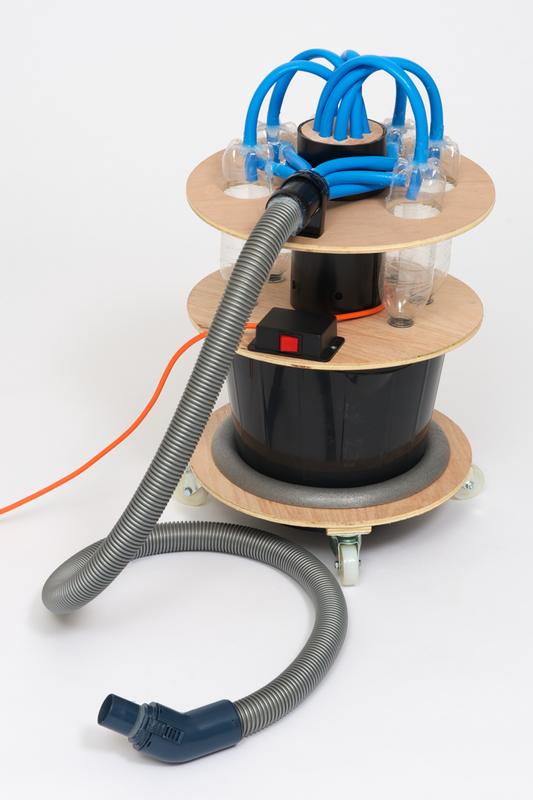 You can find out more about the Open Source Vacuum Cleaner on the project website.